Akand Path (akhand = uninterrupted, without break; path = reading) is non-stop, continuous recital of the Guru Granth Sahib from beginning to end. Such a recital must be completed within 48 hours. The entire Holy Volume, 1430 large pages, is read through in a continuous ceremony. This reading must go on day and night, without a moment’s intermission. The relay of reciters who take turns at saying Scripture must ensure that no break occurs. Sahej Path is also reciation of Guru Granth Sahib, from beginning to end, but it doesn’t have to be continuous. A person or group of persons can read the holy text according to their schedule and complete the reading of Guru Granth Sahib. Anand Karaj is the prescribed form of Sikh marriage, the words literally translate as ‘Blissful Union”. The Sikh marriage is a very special ceremony in which two individuals are joined in a equal partnership. It is joyous and festive event which is very family orientated and informal in it’s atmosphere. The Reht Maryada which is the Official Sikh Code of Conduct specifies that no thought should be given to the perspective spouses caste, race or lineage. As long as both the boy and girl profess the Sikh faith and no other faith they may be joined in wedlock by the Anand Karaj ceremony. The Reht Maryada strictly forbids any sort of dowry arrangement as marriage is not to be viewed as a business transaction. Sikhs are also discouraged from consulting horoscopes or following any other superstitions pertaining to determining a wedding date or time. The Anand Karaj ceremony can be performed in any Gurdwara or home where Sri Guru Granth Sahib has been respectfully installed. The religious ceremony cannot be performed in a hotel or banquet hall. There are no restrictions as to what time the ceremony should start or what time it should end although they are usually performed in the morning with the religious ceremony taking no more than a few hours. In Sikhism death is considered a natural process; an absolute certainty – an event that will happen sooner or later – an event that is guaranteed to take place; and only happens when the Almighty commands and never otherwise – as a direct result of God’s Will or Hukam. To a Sikh, birth and death are closely associated, because they are both part of the cycle of human life of “coming and going” ( ਆਵਣ ਜਾਣਾ , Aaavan Jaanaa) which is seen as transient stage towards Liberation, ( ਮੋਖ ਦਆਰ , Mokh Du-aar) complete unity with God. Sikhs thus believe in reincarnation. maran likhaa-ay aa-ay nahee rahnaa. Death is pre-ordained – no one who comes can remain here. However, by contrast, the soul itself is not subject to the cycle of birth and death. Death is only the progression of the soul on its journey from God, through the created universe and back to God again. In life, a Sikh tries always to constantly remember death so that he or she may be sufficiently prayerful, detached and righteous to break the cycle of birth and death and return to God. A fun and educational class held at the Gurdwara, ranging from all Gurmat topics from the very basics to more in depth with presentations, stories, games, sweets and quizes to make it all the more fun and interactive. 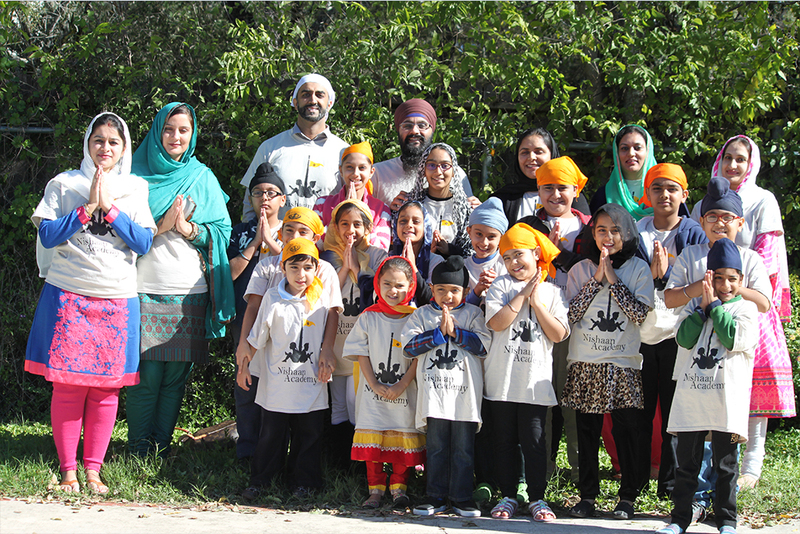 The institution of Guru’s Langar serves the community in many ways. It ensures the participation of Sikhs in a task of service for mankind. Even Sikh children help in serving food to the people (Sangat). Langar also teaches the etiquette of eating in a community situation. Moreover, it plays a great part in upholding the virtue of equality of all human beings and provides a welcome, secure and protected sanctuary to the needy. The term Langar literally means kitchen where food is prepared and served in a Gurdwara to all the visitors (without distinction of background) for free. Only vegetarian food is served, to ensure that all people, regardless of their dietary restrictions, can eat as equals. 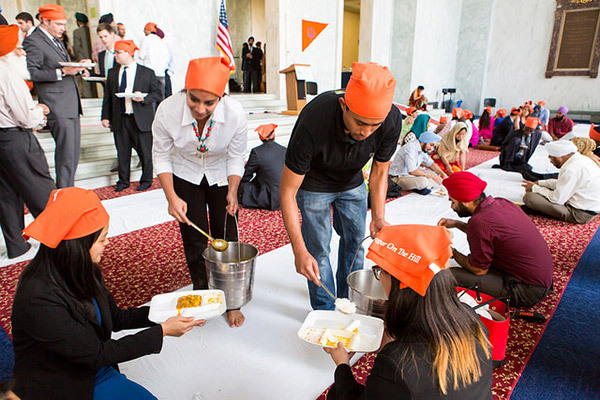 Langar is open to Sikhs and non-Sikhs alike. The institution of the Langar, or free kitchen, was started by the first Sikh Guru, Guru Nanak.